Synopsis: Panic began as so many things do in Carp, a dead-end town of 12,000 people in the middle of nowhere: because it was summer, and there was nothing else to do. Heather never thought she would compete in Panic, a legendary game played by graduating seniors, where the stakes are high and the payoff is even higher. She’d never thought of herself as fearless, the kind of person who would fight to stand out. But when she finds something, and someone, to fight for, she will discover that she is braver than she ever thought. Dodge has never been afraid of Panic. His secret will fuel him, and get him all the way through the game, he’s sure of it. But what he doesn't know is that he’s not the only one with a secret. Everyone has something to play for. For Heather and Dodge, the game will bring new alliances, unexpected revelations, and the possibility of first love for each of them—and the knowledge that sometimes the very things we fear are those we need the most. What I Thought: Panic is an exciting thrill adventure that kept me wanting to know what challenges the contestants of Panic were going to go through next! Carp is a small town with nothing to do, and the game of Panic was created. Each year, a bunch of seniors decide to participate for a whole lotta prize money, usually which can get the winner onto greener pastures than what they leave behind. For Heather, it's a chance to get herself and her sister away from her druggie mother and have a chance at a real life. For Dodge, it's a chance for revenge for his sister. For Nat, it's a ride to LA and the acting career she so desperately wants - but in the end, there is only one winner. My problems with this beautiful story was the absolute fake characters - best friends lied to each other, deceived each other, stabbed each other in the back and then pretended like nothing ever happened. Between Heather, Nat, Bishop and Dodge, it happened countless times, and began to grate on my nerves a bit. But what really did it for me, was the challenges of Panic. I didn't particularly care about the background, I wanted the action. What were they going to do next? Would they die? Most importantly, who would win? Of course all the answers came and they were extremely satisfying. 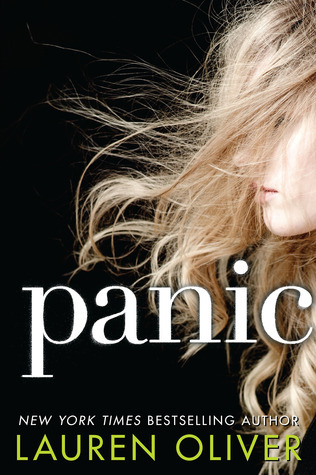 Panic is quite different to Oliver's Delirium series, which she is most famous for, but I would definitely say that Panic will give it a run for it's money! The Good: Different concept that left me wanting to read without stopping - didn't want to put it down! The Bad: The characters who I loved to hate most times, and some of the twists I figured out pretty early on. I enjoyed this but I agree with you about the characters, I didn't find any of them interesting. Sounds like a good one! I love the cover, too!